When it comes to bulk liquid transport, the method used by a company can be focused directly on the price involved or it may be related to the particular product being shipped. 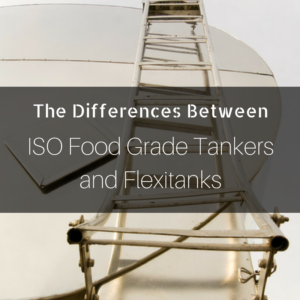 Since such considerations can be important when it comes to deciding between ISO tankers and flexitanks, listed below are some distinct differences when it comes to these two particular options. Given the sturdy nature of tankers versus what amounts to bags, it’s obvious that the length of service for the former will much longer. Estimates of up to three decades have been offered in comparison to a flexitank, which ends up being disposed of once a delivery has taken place. Tankers can withstand a great deal of jostling, specifically because they’re made of stainless steel and insulated from any contaminants or hazards that could be present in a shipping area. In addition, proper washing of the tanker offers more protection in this area. Those companies using a flexitank setup can leave their product vulnerable to either contamination or outright spillage because of the danger of a bag being punctured by some unforeseen issue. For bulk liquid transport, delivering with a food grade tanker allows for a single large delivery as opposed to using multiple flexitank bags for the same delivery. Another issue stems from orders that don’t require the maximum space available. When that mode of delivery is a food grade tanker, that’s not a problem, something that can’t be said for the flexitank option. In that situation, constant movement from available space, otherwise known as underloading, can cause the flexitank to eventually burst. Due to the disposable nature of a flexitank, there’s no daily rental fee involved when using the item, though a disposal fee is usually involved. Such rental costs can add up quickly when international shipping is part of the equation. Plus, the fees for an ISO tank that are built into the final cost, which can include washing and return assessments, can make what seems like an economical move into a financial mistake. ISO tankers can sometimes be difficult to find, which means that when supply is tight, the costs to rent one will be higher. Also, space considerations may make shipping more difficult. In contrast, the availability of flexitanks for shipping companies is never really an issue, while the name itself is an indication that finding room when items need to be shipped is rarely a problem. In the area of shipping, it’s much easier to load and discharge items using a flexitank setup. With a tanker, the bulky nature of it prevents any quick removal situation, which can be a cause for concern when it comes to particular time-sensitive products. Kan-Haul has been a part of the bulk liquid transport business for the last three decades. That longevity has been primarily due to the company’s ability to deftly pivot toward what customers need. Whether that means using ISO food grade tankers or flexitanks, the customer always has the option of making that particular choice. So when deciding on exactly who to choose for this important matter, make sure to contact us.